If you’re a bookkeeper looking to generate more income from your business, you probably already know that you can’t just keep working longer hours. Working harder isn’t going to get you the freedom, peace of mind, and additional revenue you’re looking for. You’re only one person, after all – and there are only so many hours in a day. So if you can’t just keep working more… what can you do instead? Step outside the daily grind of your practice, and start making the changes that will bring the income and freedom youreally want from from your business. Clearly see what’s possible with your business, so you can develop a clear plan for working less, and getting paid more. Recognize your true value as a bookkeeper, so you can feel confident selling your services and raising your prices. Get the momentum and enthusiasm you need to start making changes right away. …even if you’re so busy in your business that you feel like you don’t have a chance to breathe, much less strategize. …even if you’re new to bookkeeping, and you don’t have a full slate of clients yet. Back in 2001, I had a successful bookkeeping business…but I didn’t have much of a life. I had plenty of clients, but I was working nights and weekends trying to keep all of them happy. I didn’t see much of my husband and kids, especially during deadline time, and I was stressed out and cranky most of the time. Despite the problems, I knew I didn’t want to hire another bookkeeper to help with the workload, because I’d spent years cleaning up the messes left behind by bad bookkeepers. There was no way I was going risk my reputation by hiring someone I couldn’t count on. I was working long hours every day, but never got the chance to step back from the daily grind and figure out how to make changes to the way I was running my company. …when I met business coach Peter Cook. What I needed was to look at all aspects of my business – not just the technical aspects of bookkeeping and meeting deadlines for my clients – and develop a strategic plan for growing my company, bringing in more revenue, and creating the freedom I wanted. And with Peter’s help and support, that’s exactly what I did. Over the next decade, we worked together to grow my business to a successful, profitable operation with a team of 12 highly-skilled bookkeepers. Most importantly, I was able to run the business in a way that fit my life and my family. I could take plenty of time off, and I knew the business would run successfully without me. 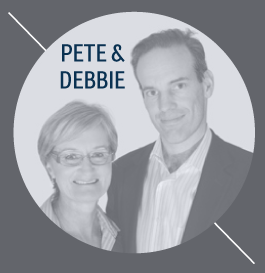 These days, Peter and I help other bookkeepers grow their businesses through our online programs, live events, and interactive workshops. We’ve helped thousands of bookkeepers make more money and create businesses that give them more revenue, freedom, and peace of mind. And we’d like to help you, too. Introducing the Bookkeeping Business Boardroom. The Bookkeeping Business Boardroom is a live, interactive, in-person workshop that is designed specifically for bookkeepers. During this 3-hour session, Peter and I will help you develop a clear plan for accelerating the growth of your business without burning yourself out or working yourself to death. In this workshop, we’ll show you why the secret to getting more clients and earning more money ISN’T working harder and longer. The secret is exploring what’s possible, setting goals based on what’s important to you, and developing a plan for reaching (or exceeding) those goals. This is a “work and learn” workshop, not a seminar, and Peter Cook and I will be there to guide you through the process of creating your own strategic plan. You’ll also complete a bit of prep work on your own, before the workshop – and that work will help you get inspired and develop your plan for creating the business you really want. You’ll walk out of the live session with a clear, written, strategic plan in your hands – and you’ll be crystal clear about the next steps you will take to grow your business. Numbers are strictly limited: Sign up today to reserve your spot. If you’re a Registered BAS Agent, you’ll get six hours of professional development credit for this event (which includes your prep work and the time you’ll spend in the live workshop). A 3-hour live, interactive, “learn and work” workshop with me and business coach Peter Cook. A clear, written, strategic plan that will get you to the next level in your bookkeeping business. Access to the Business Accelerator Program, where you’ll discover the most effective marketing strategies for growing your business. Advice and coaching on how to get past some of the biggest hurdles in your business – including marketing woes and hiring qualified bookkeepers. A personalized, one-on-one phone coaching session with one of our bookkeeping business advisors. Our Bookkeeping Business Boardroom workbook, so you’ll be able to keep all your work in one place and you’ll be able to take action as soon as you leave the workshop. The inspiration and clarity you need to accelerate your business – so you can start working less, and getting paid more. The E-Myth Bookkeeper has been call the new business bible of the bookkeeping industry and is a must read. We’ll be shipping this out immediately upon your registration. On the fence about joining us for the Bookkeeping Business Boardroom? We want to give you every chance to register with confidence, which is why we have a hassle-free guarantee for this workshop. And you won’t just be happy with the workshop – we guarantee that you’ll be 100% blown away. After the workshop, if you don’t feel like your experience was worth ten times what you paid, just let us know. You’ll get an immediate apology and a full refund of your investment. Over 1250 bookkeepers have attended our workshops, and we’re proud to say that no one has ever asked for a refund.